PRIME Minister Narendra Modi will dedicate to the nation the modernised and expanded plant of state-run steel maker SAIL at Bhilai, today. Bhilai is Steel Authority of India Ltd's (SAIL) largest plant and major producer and supplier of rails for Indian Railways including 260 metre long rails. 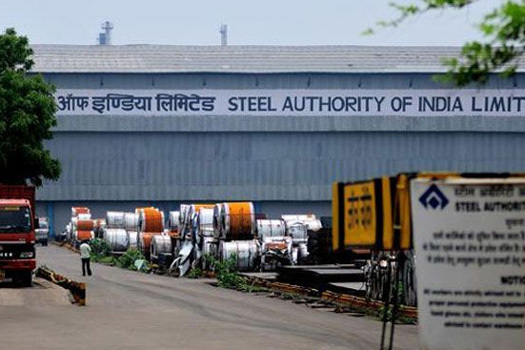 "Prime Minister of India Narendra Modi to dedicate SAIL's modernised and expanded Bhilai Steel Plant, Bhilai Chhattisgarh" to the nation on June 14, a SAIL official said. will dedicate to the nation. In 2015, he had dedicated Rourkela and IISCO steel plants. SAIL had undertaken about Rs 70,000 crore modernisation and expansion of its integrated steel plants. The capacity to produce rails at Bhilai steel plant has reached 2 MTPA from 0.8 MTPA after modernisation. Bhilai is also a major producer of large variety of wide and heavy steel plates and structural steel. Earlier, SAIL posted a net profit of Rs 816 crore in Q4FY18 against a loss in the same period last year. For the full year FY18, SAIL remained in the red though it managed to hammer down its consolidated net loss to Rs 281 crore from a loss of Rs 2,756 in FY17. The state-owned steel giant said net profit of Rs 816 crore in Q4FY18 came after a provision of Rs 582 crore towards enhanced gratuity recently approved by the government. It also said that all the five integrated steel plants of the company recorded individual profits in Q4 FY18. Steel Authority of India Limited (SAIL), a Maharatna PSU under the Ministry of Steel, is one of the largest state-owned steel making companies, and one of the top steel makers in world. With an annual turnover of Rs 43,337 crore (US$6.8 billion) (FY 2015-16). Incorporated on 24 January 1973, SAIL has 79,601 employees (as of 01-Oct-2017). With an annual production of 13.9 million metric tons, SAIL is the 24th largest steel producer in the world. SAIL operates and owns five integrated steel plants at Bhilai, Rourkela, Durgapur, Bokaro and Burnpur(Asansol) and 3 special steel plants at Salem, Durgapur and Bhadravathi. It also owns a Ferro Alloy plant at Chandrapur. As a part of its global ambition, the PSU is undergoing a massive expansion and modernisation programme involving upgrading and building new facilities with emphasis on state of the art green technology. SAIL is a public sector company, owned and operated by the Government of India. According to a recent survey, SAIL is one of India's fastest growing PSUs. Besides, it has R&D centre for Iron & Steel (RDCIS), Centre for Engineering and Technology (CET), Management Training Institute (MTI) and SAIL Safety Organisation (SSO) located at Ranchi capital of Jharkhand.